Hannover/Germany. At the INTERSCHUTZ 2015 firms are showing innovative equipment and research projects. Hannover: on land, sea or in the air – radio controlled drones and robots are finding their way into the future of fire departments. They are one of the main magnets for trade visitors at the INTERSCHUTZ 2015. The fire brigade Dortmund and different other firms are demonstrating how modern technology can be used without endangering human life. At only four kilograms in weight, the tiny vehicle that is being presented by the French firm Nexter Robotics can be attached with different extensions, detectors for radioactive material, infrared cameras, even microphones. This enables it to take diverse measurements or even allow the fire brigade to talk to accident victims in difficult terrain. 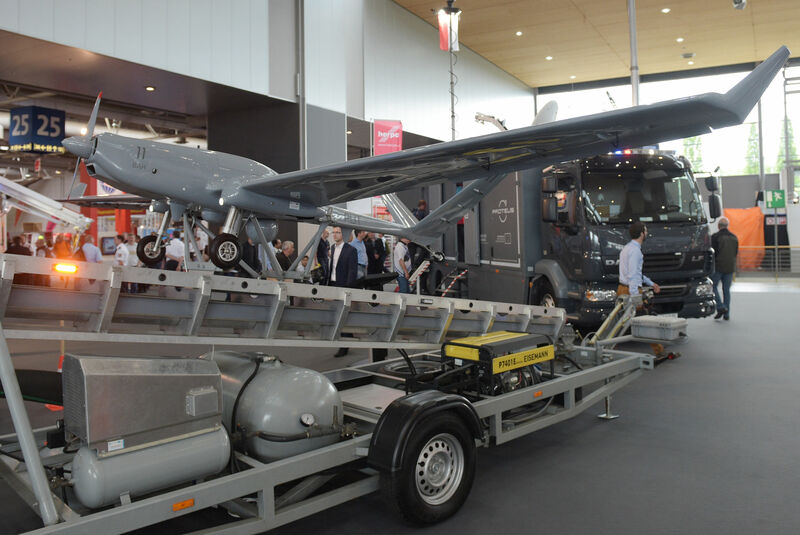 Also besieged are the Robots from the French-German-Chinese joint venture development project called Gimaex, Scorpe and Grumman (Pavilion 33). “Life is too precious to endanger it needlessly”, stated a representative from the stand, as he demonstrated the flexibility of the equipment, that among other things have large fans that can produce drizzle from up to 3 000 liters of water per minute. The size of it depending on the intended application. The visitors were fascinated at the joint stand of the Hannover fire brigade (Hall 25/D14) and the fire brigade from Poznan (Poland). From the 2.85 meter long and 6.40 wide drone of PROTEUS-Systems. In contrast, the Fire Department of Dortmund shows examples of a so called Quadrocopter and explained the objective of the research project TRADR from the IFR (institute for fire and rescue technology), which is directed at the use of teams consisting of human and part autonomous robot systems to examine safety related issues.